Lombok Indonesia and the three Gili islands (Gili Trawangan, Gili Meno, Gili Air) has become a new paradise for tourists in Indonesia besides Bali. The three Gili islands with an abundance of beauty, gives a different nuance for tourists while on vacation on the island. 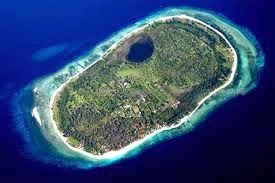 One of the islands that now the attention of tourists from various countries is Gili Meno. Lombok has many attractions. Gili islands consisting of Gili Trawangan, Gili Meno and Gili Air is one of the tourist destinations in Indonesia are known to the whole world. Gili Island is perfect for travelers who want a quiet atmosphere and away from the bustle of the city. Gili Island offers spectacular views of the reef to be explored. 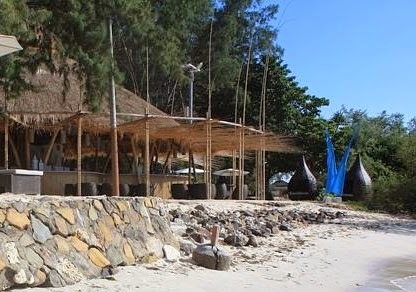 Attraction of Gili Meno is the smallest island, of the three famous Gili, in Lombok. Privileged Gili Meno, as if crushing fatigue tourists who vacation in the island. The island is very calm and quiet until now. Who knows how long the peace of Gili Meno can survive. Since it is very comfortable and quiet, a lot of foreign tourists freely wearing a bikini and sunbathing on the beach, without fear disturbed by other visitors. Of the three Gili islands in Lombok are very famous, most crowded and most of it is Gili Trawangan. Loneliest and quietest, is Gili Meno. When you are on this island, you seemed to have this island. You will not hesitate to pass any activity on this island. Sunbathing, jogging, swimming, diving, all can be done with a quiet and comfortable. But you still have to be careful with the situation around you. Usually the tourists just stop by for a moment to Gili Meno. They will not settle too long in this island. Because the supporting facilities of tourism on the island is very minimal. Usually the tourists choose their primary goal to Gili Trawangan for fun. Gili Trawangan is free by vehicle fumes. Also for the other two Gili islands in Lombok Indonesia. Bali has now become an island with a population very much. Traffic jams everywhere. Therefore, Lombok has now become a new paradise for foreign tourists who want to vacation and looking for tranquility, of course, at a low price but can give satisfaction. 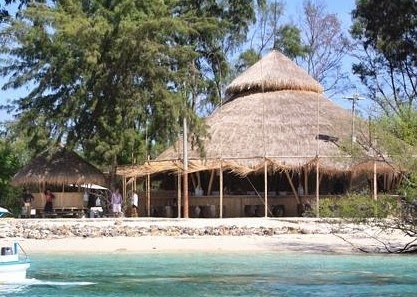 In Gili Meno, the tourists can stay in simple houses with roofs of thatch. Natural shades are felt. Beaches with clean white sand. It is very difficult to find trash on this beach, unlike in Kuta, beach of trash that had accumulated during the rainy season. Fresh breeze and pollution-free. When you are sun bathing on the island, you can feel very comfortable, quiet, and fun. Many people recommend Gili Meno Lombok as a place for honeymooners. If a newly married want to honeymoon on the island, so it was a perfect choice and good. There will be no interference from street vendors while walking on the beach. There is no interference from other tourists who just make noise. The island is very quiet. If you are honeymooning on the island, you will find this island belongs only to you and your lover. May the peace of Gili Meno and Gili three islands in Lombok Indonesia, can be maintained. Hopefully Lombok remains a quiet tourist destination comfortably and safely. Unlike the island of Bali which has now become a hell for some foreign tourists.